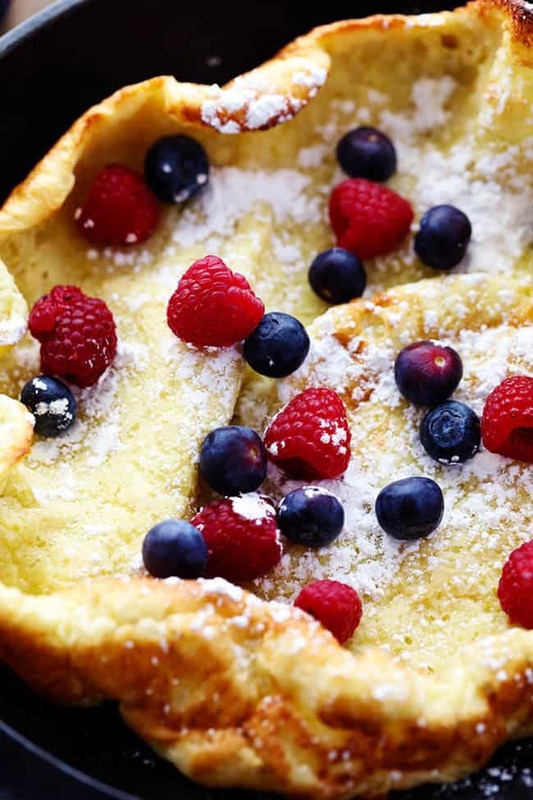 German Oven Pancake is a hot and puffy golden pancake that only requires 5 minutes of prep! This classic breakfast is always a huge hit at our house! We love a good classic breakfast at our house. Try this Breakfast Casserole, Belgian Waffles, or these Mini Puffed Oven Pancakes for a breakfast the family won’t be able to get enough of! Breakfast is always a struggle at our house because mornings are always so busy! I love to surprise the kiddos with a delicious and hot breakfast at least once a week before school. That is why we love German Pancakes at our house. 5 minutes of prep with ingredients that you have on hand. This breakfast is totally doable even for the busiest families! My little girl loves to watch things baking in the oven. She likes spending time with me in the kitchen and helping. Or making a mess. But we sure have fun together. It is fun to watch this german pancake bake in the oven and get puffy and golden. As soon as it comes out we all get to top it with our favorite toppings. I like mine simple with fruit, powdered sugar, and syrup. But you can go the more traditional German Pancake way of sprinkling with some lemon juice and powdered sugar. If you haven’t tried this classic breakfast you need to make it. We absolutely love it at our house and it is so fun and easy to make! It is sure to be a huge hit with family or guests! What are German Pancakes made of? 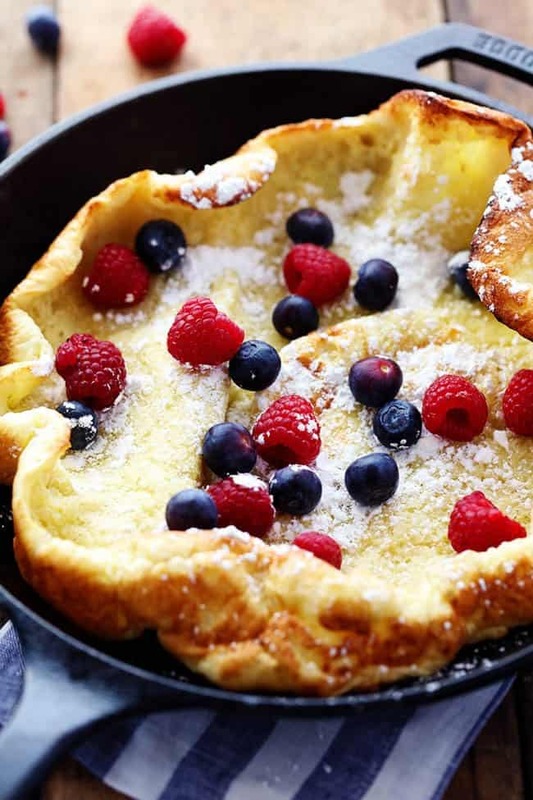 German Pancakes or Dutch Baby Pancakes are made with eggs, milk, flour, and vanilla. They are made in a metal or cast iron pan. They will puff up. in the oven and fall as they cool. How do you make German Pancakes? Preheat oven to 450 degrees. In a medium sized bowl whisk the eggs, milk, melted butter, salt and sugar. Add the flour and stir until incorporated being careful not to overmix. Add 1 tablespoon melted butter to the bottom of a 9 or 11 inch cast iron skillet. Pour the batter into a skillet and bake for 12-18 minutes or just until the edges start to brown. Top with desired toppings. Are German Pancakes really from Germany? 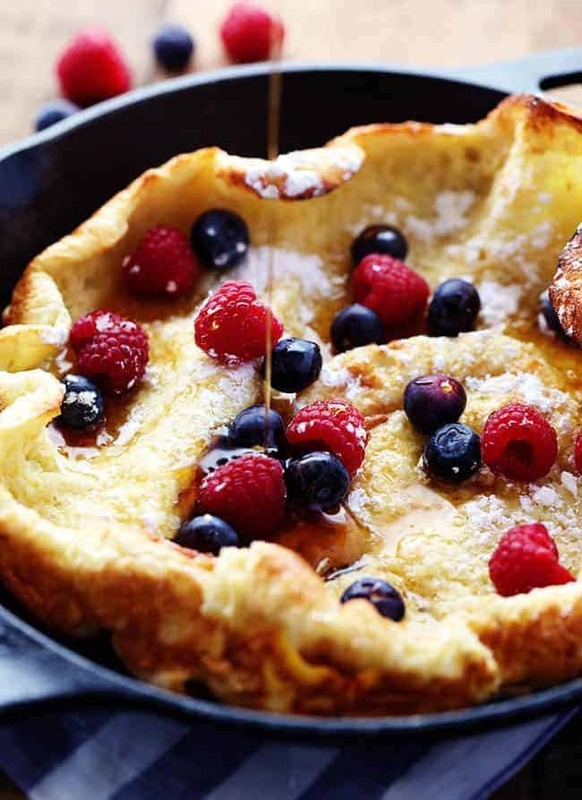 German Pancakes or Dutch Baby Pancakes are not German Pancakes the way they are prepared in Germany. 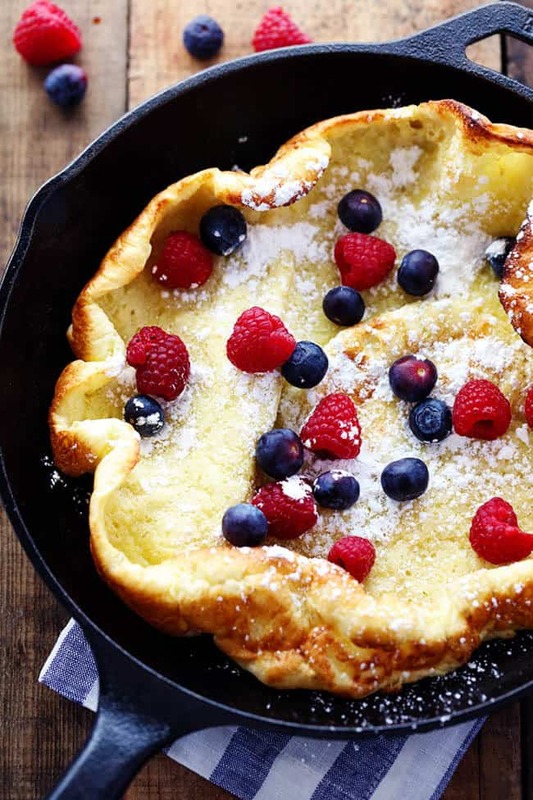 The American “German Pancakes” are more like a popover, either entirely baked in the oven or started in a pan and finished in the oven. Looking for more delicious breakfast ideas? Look no further! I have tried a few other recipes for the German Pancake. Yours is by far the best. I used a pie plate and it came out perfect. Yummy! I drizzled a little lemon juice on top after taking from the oven as some other recipes do. Then top with fruit and serve with maple syrup. Your recipe is great! Perfect for the two of us. MMM! Lemon juice does taste great on these pancakes! Thank you for sharing! I’m always looking for new breakfast ideas. This was fast easy and good and filling. Will try lemon juice on it next time. It got the husband approval. Yes, this recipe works great without the sugar. I have been making this dish since my uncle taught me back in the 1970s. We use only 2 eggs. Will try it with 3 as you have noted. Have always been cautioned to melt the butter in a hot pan then add the batter, keep it on the stove for a minute, and then put it in the oven. Make this on hungry Sundays or when I have guests. I like the idea of using a cast iron skillet. Would make the pancake rise even more. Sometimes looks like a popover, but you can remove it from the oven before that stage. Thanks for the reminder. Love this! Can I substitute almond flour and monk sugar in this? I have not tried those substitutions before but you are more than welcome to try them. If you do I would love to know how it turned out! Enjoy! No, not with this recipe. 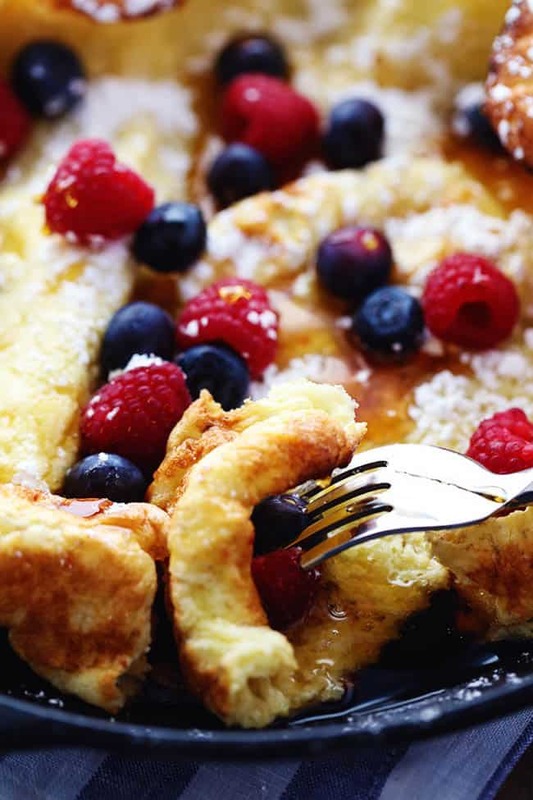 It is best to follow the recipe to get the best results for German pancakes.